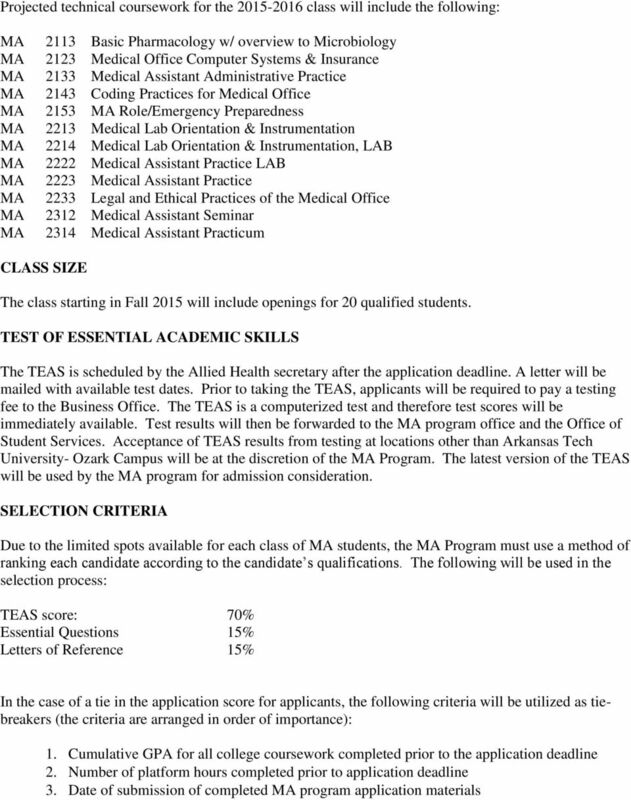 Download "MEDICAL ASSISTING (MA) PROGRAM 2015 APPLICATION INSTRUCTIONS"
2 3. 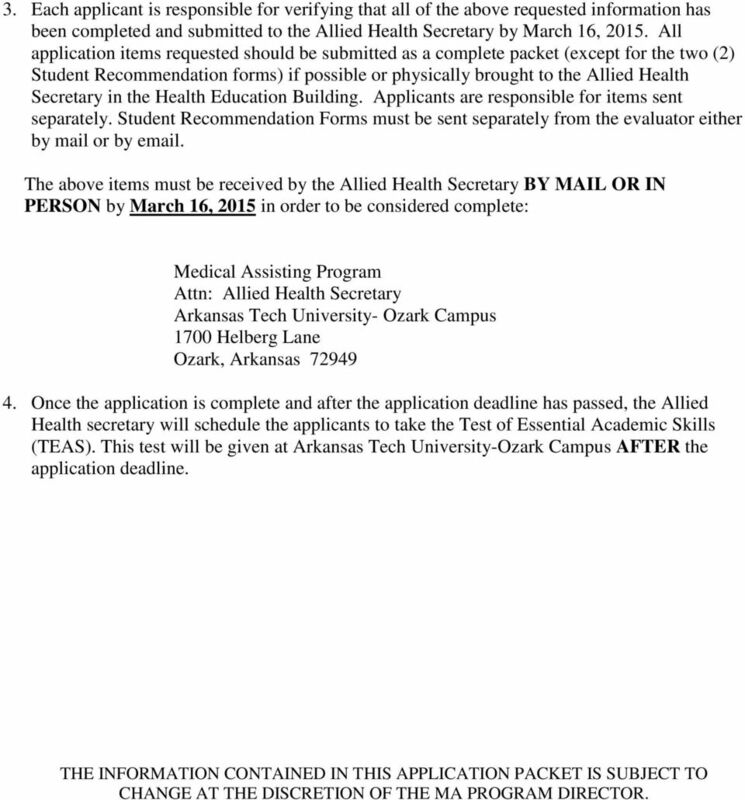 Each applicant is responsible for verifying that all of the above requested information has been completed and submitted to the Allied Health Secretary by March 16, All application items requested should be submitted as a complete packet (except for the two (2) Student Recommendation forms) if possible or physically brought to the Allied Health Secretary in the Health Education Building. Applicants are responsible for items sent separately. 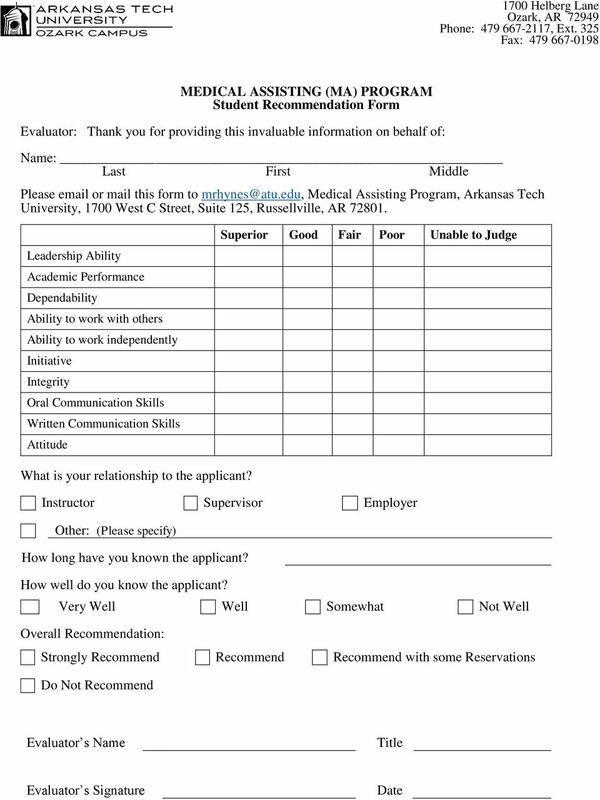 Student Recommendation Forms must be sent separately from the evaluator either by mail or by . 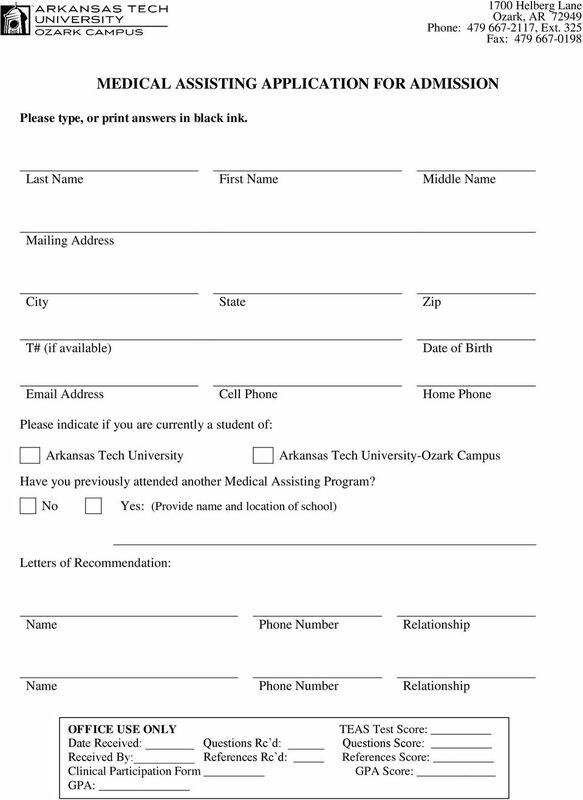 The above items must be received by the Allied Health Secretary BY IL OR IN PERSON by March 16, 2015 in order to be considered complete: Medical Assisting Program Attn: Allied Health Secretary Arkansas Tech University- Ozark Campus 1700 Helberg Lane Ozark, Arkansas Once the application is complete and after the application deadline has passed, the Allied Health secretary will schedule the applicants to take the Test of Essential Academic Skills (TEAS). 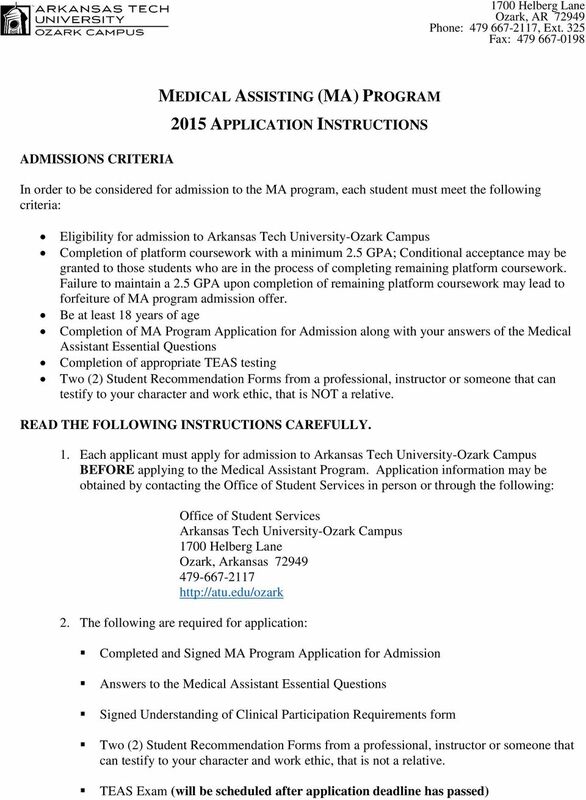 This test will be given at Arkansas Tech University-Ozark Campus AFTER the application deadline. 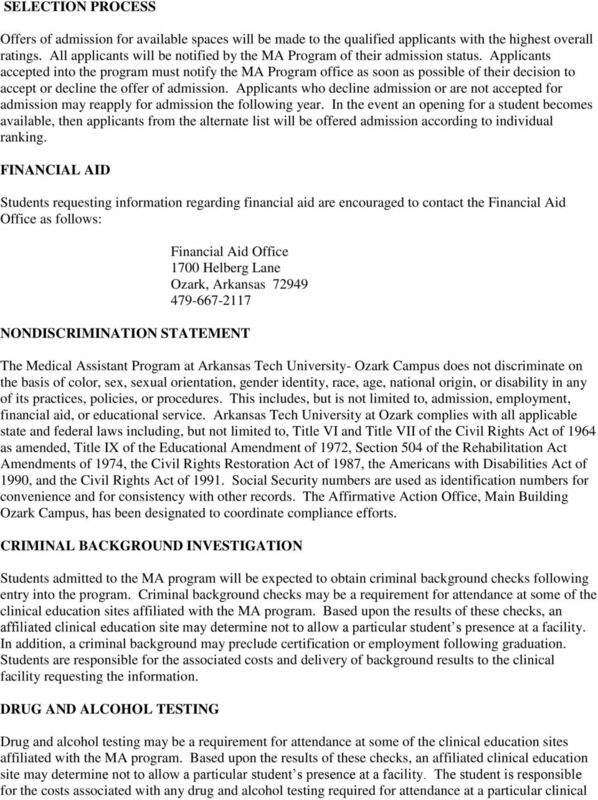 THE INFORTION CONTAINED IN THIS APPLICATION PACKET IS SUBJECT TO CHANGE AT THE DISCRETION OF THE PROGRAM DIRECTOR. 3 Cour MEDICAL ASSISTING PROGRAM DESCRIPTION Medical Assistants are valuable members of the health care team and are trained to perform both administrative and clinical duties. 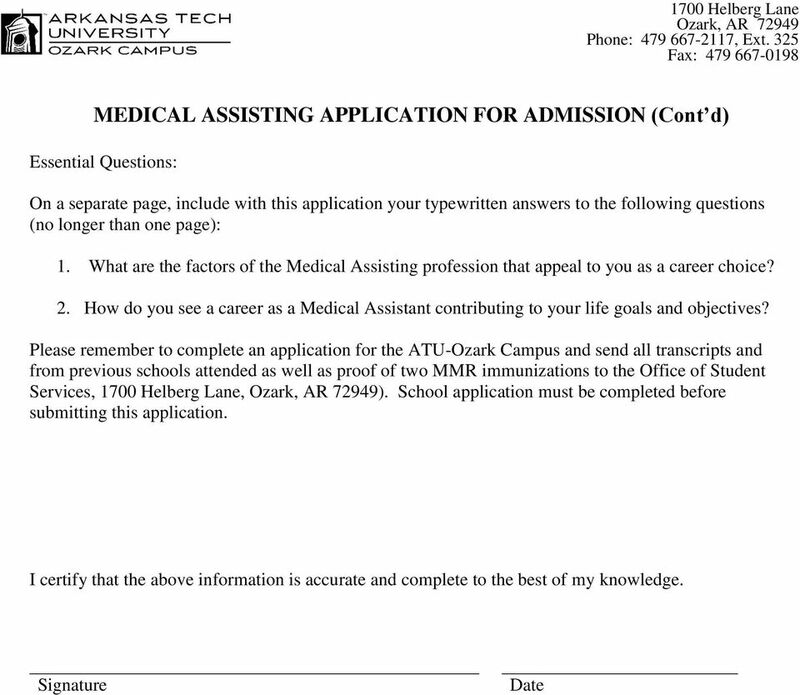 The medical assistant curriculum is a two-year associate of applied science degree program. This program offers the student a broad foundation in basic medical assisting skills, including a period of practical experience in a medical facility working under the supervision of clinic personnel and the Medical Assistant Program Director. Basic Medical Assistant training and education consist of learning experiences in science, communication skills, insurance and general office practices, as well as medical laboratory and examination room procedures. PLATFORM Students will be required to complete 24 hours of platform coursework with a minimum 2.5 GPA prior to admission to the technical phase of the Program. Applicants with platform coursework completed at other institutions should have their official transcripts sent to the Office of Student Services for review. 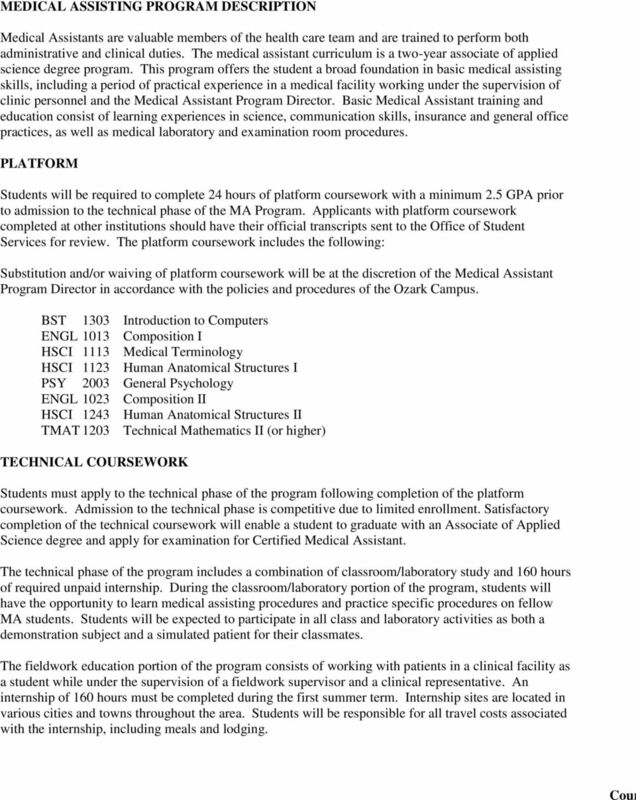 The platform coursework includes the following: Substitution and/or waiving of platform coursework will be at the discretion of the Medical Assistant Program Director in accordance with the policies and procedures of the Ozark Campus. BST 1303 Introduction to Computers ENGL 1013 Composition I HSCI 1113 Medical Terminology HSCI 1123 Human Anatomical Structures I PSY 2003 General Psychology ENGL 1023 Composition II HSCI 1243 Human Anatomical Structures II TT 1203 Technical Mathematics II (or higher) TECHNICAL COURSEWORK Students must apply to the technical phase of the program following completion of the platform coursework. Admission to the technical phase is competitive due to limited enrollment. Satisfactory completion of the technical coursework will enable a student to graduate with an Associate of Applied Science degree and apply for examination for Certified Medical Assistant. The technical phase of the program includes a combination of classroom/laboratory study and 160 hours of required unpaid internship. During the classroom/laboratory portion of the program, students will have the opportunity to learn medical assisting procedures and practice specific procedures on fellow students. Students will be expected to participate in all class and laboratory activities as both a demonstration subject and a simulated patient for their classmates. The fieldwork education portion of the program consists of working with patients in a clinical facility as a student while under the supervision of a fieldwork supervisor and a clinical representative. An internship of 160 hours must be completed during the first summer term. Internship sites are located in various cities and towns throughout the area. Students will be responsible for all travel costs associated with the internship, including meals and lodging. 6 education site. 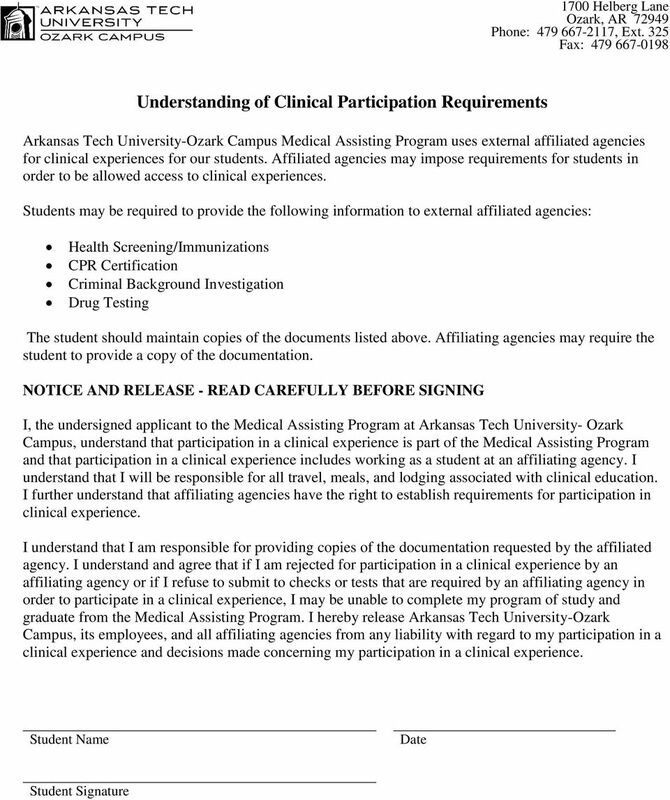 In addition, the student is also responsible for submission of testing results to the clinical education facility requesting the information. STUDENT HEALTH AND PHYSICAL EXAMINATION Students admitted to the program will be expected to provide health information and participate in a physical examination to be performed by a physician, physician s assistant, or nurse practitioner. The purpose of the physical examination is to determine the student s ability to safely perform the physical demands expected of a Medical Assistant. The purpose of the Health Information form is to enable the student an opportunity to provide pertinent information to the Program which may affect the student s ability to safely participate in laboratory and clinical education activities. G E T I N. G E T O U T. G E T O N W I T H Y O U R L I F E.